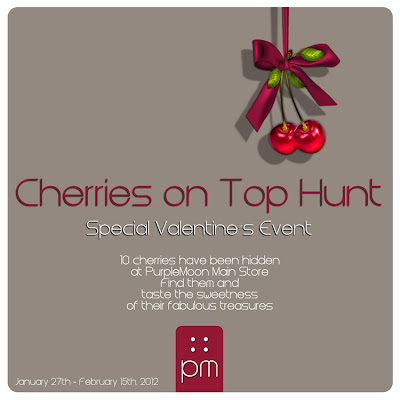 Cherries on Top Hunt - A Valentine's event at PurpleMoon | ! *PurpleMoon Creations* ! 5- There are no hints given. They are easy to find and this is more for the fun of it than anything else. They are only hidden at the FIRST FLOOR of the Main Store (8 cherries) and in the BOHO HOUSE (2 cherries), across the garden.